- Capacity ranges from 1 Ton to 25 Ton. - Automatic double pawl braking system. 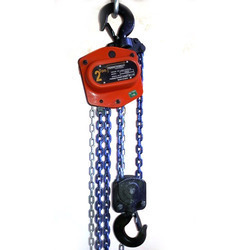 We deal with a high quality of Chain pulley blocks which are available in both electrical operation and manual operation, Chain pulley block are used as a viable alternative of electric hoists having identical features of Hoists, These are used in all kinds of Industries due to a minimum maintenance and for a ease of Handling. We provide Chain pulley block at various capacities. Our name is enlisted amongst the clients for offering wide array of Chain Pulleys. Our products are used in various industries for their rust free nature. Our Chain Pulleys are highly demanded in the market for their effective usage and high grade quality. Moreover, our Chain Pulleys are easy to use and reliable too. 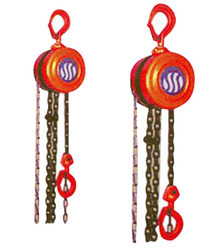 Our company has gained name and fame in presenting Heavy Duty Chain Pulley.